Spiny, woody, evergreen or semi-deciduous shrub often 2-3 m tall, sometimes used as a hedge plant. Characterised by its very sharp spines that are single or divided into three. Small yellow flowers followed by small purple berries covered in a white bloom. Flowers Petals and sepals yellow, flowers 5-7 mm in diameter, with an unpleasant smell. In many-flowered drooping simple or compound inflorescences up to 6 cm long. Flowers Oct-Nov.
Fruit Small, purplish, oblong berries, 7-12 mm long, with a white bloom. Seeds are dispersed by birds. Leaves Elliptical to ovate, up to 7.5 cm long by 2.5 cm wide and often spiny-toothed. Stems The main stems have yellowish-grey bark and very sharp, single or three-pronged thorns, up to 2 cm long, in the leaf axils. Waste places, reverting hill country, scrub, forest margins and former house sites. Locally common in some higher rainfall lowland areas in NI and the northern half of SI. Originally from the western Himalayas. Planted as a hedge in many parts of NZ, and has spread out of control in many areas, especially on broken or hilly ground where control is difficult and intense stock grazing (for controlling seedlings) is harder to achieve. 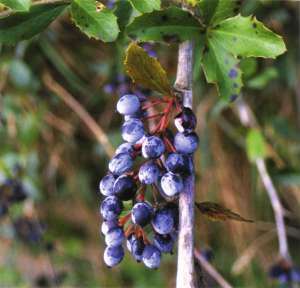 Barberry is subject to Pest Plant Management Strategies in several regions of NZ. Details are available from the regional councils or unitary authorities. Darwin's barberry (Berberis darwinii) is an evergreen shrub up to 4 m tall, with attractive, deep orange flowers in simple drooping racemes up to 7 cm long and dark purple berries with a bluish-white bloom. The small, shiny dark green holly-like leaves alternate in clusters of three to five, together with five-pronged, needle-sharp spines. This species flowers Jan-Dec, and is found in scrub, forest and plantation margins, road-sides, being locally common in Wellington and Wairarapa in NI and very common from central Canterbury to Southland in SI and Stewart Island. Listed on the National Pest Plant Accord (see Introduction for details). European barberry (Berberis vulgaris) occurs around old homesteads and in some plantations, in inland Canterbury and Otago. It is a deciduous shrub up to 2 m high, losing its leaves in winter, and with oblong, red fruits. 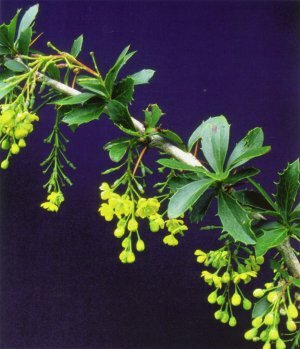 Berberis (from the Arabic) = barberry; glaucocarpa (Lat.) = fruit with a bloom.